Making a video game is an expensive endeavor, particularly if you want anything approaching triple-A quality. That’s why, when companies make a high-quality game, they generally want to make sure that people who would be interested in buying it (or playing it and paying for in-game perks, in the case of free-to-play games) first hear about the game. Advertisement expenses can vary wildly, but a common estimate is that the advertising budget for a game will be around half its development cost. Even when you think a game might have name recognition enough that the gaming press will pick up on it and give it a ton of free advertising, companies will still spend through the nose to reach an even wider audience. Just look at the advertising blitz Nintendo made for Super Mario Odyssey, which included a music video for the song they composed for it, Jump Up, Super Star! But last year, Japanese developer Namco-Bandai decided to take a different approach. With a worldwide release of their new mobile game, Tales of the Rays, they decided that rather than spending money to make sure interested players heard about the game, they’d rather not spend that money and hope that players would somehow find out about the game anyway. Because of this, you probably haven’t heard of Tales of the Rays, so let me tell you a bit about it. 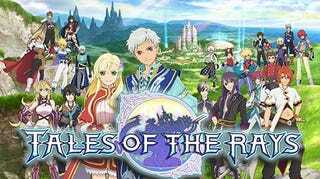 TotR is a spin-off of the long running Tales series, which is a JRPG series with an action combat system which evolves from game to game. Like the Final Fantasy series, most of the Tales games have no story connections to each other (although the series does have more exceptions to this than Final Fantasy does). The series is utterly massive, comprising a total of 16 games in the primary series plus various spin-offs. The premise of Tales of the Rays is simple: It’s a Tales game for mobile devices, with a massive crossover between characters from all the main series games (and even some other spinoffs). Unlike past Tales games for mobile devices (Tales of Asteria and Tales of Link), Tales of Rays is mechanically similar to the rest of the series, but designed from the bottom up so that the combat system will work well on smartphones, and features high-quality 3D graphics (by mobile device standards, at least). Since the mobile market is easily turned off by an up-front price tag, Tales of the Rays went with a free-to-play model which allowed players to get characters for free simply by playing through the story and events, and with a summoning system (often called “gacha”) used for equipment, which unlocks special moves (“artes”) for each character. Players received ample amounts of the premium currency simply by playing as normal, and could easily get a good array of equipment for any new character, but there was the option to purchase more premium currency to stack the odds in your favor and try to get all the equipment you wanted. Unlike many other games with summoning systems, Rays had pretty generous odds. The rarest summonable items, “Mirages,” which buffed a character’s stats and gave them an upgraded special attack they could use once every few battles, had a generous 5% rate of being summoned (as compared to a more-typical 1-3% rate for the rarest summonables in other games). Given that it was relatively easy to stock up enough of the premium currency for 20 summons whenever a new character was released, this gave players a decent chance of getting that character’s Mirage without having to pay. So, we have a game from a popular series, providing lots of fanservice with characters crossing over, with a good combat system on mobile devices for the first time, and with a monetization system that was relatively generous to those who didn’t wish to pay for anything. Sounds like a recipe for success, doesn’t it? And indeed it was, when the game was released in Japan. When the game was released for a worldwide audience, however, Bandai Namco decided that rather than spend money to promote it and help build a playerbase, they would rather not spend that money and not build a playerbase. Instead, their advertising budget was spent on the other mobile Tales game available worldwide, Tales of Link, despite the fact that ToL was already a couple years old at this point and reaching the end of its life-cycle. While a strong advertising push could have helped encourage the remaining playerbase of Tales of Link to give Tales of the Rays a try, as well as draw in lapsed fans and new players, this push wasn’t to come. Relying solely on word-of-mouth about Tales of the Rays and a few announcements of its release on gaming news sites, the game drew only a paltry playerbase of those lucky enough to hear about it. Reconsider your decision not to advertise TotR? Institute a crossover event to draw Tales of Link players to TotR? Experiment with different payment models, sales, and/or bundles to try to make more money from the existing playerbase of TotR? Keep running TotR at a loss to keep the playerbase engaged until you’re ready to announce a new console game, and make that announcement just after announcing the cancellation of TotR? Cancel the worldwide version of TotR, but allow players to migrate their accounts to the Japanese version, and maybe consider official translation patches for it? Decide to cut your losses and cancel TotR at the same time as Tales of Link in order to, if nothing else, rip the band-aid off quickly and let the fanbases of the two games mourn together? Well, if you picked any of the above options, you’re unfortunately wrong. Instead, the correct answer was to wait until Tales of Link turns off its servers, and then, rather than try to migrate its playerbase to Tales of the Rays, announce the next day that the worldwide version of TotR is closing as well. If you know anything about gaming fanbases, you should know that there’s no way that things can go poorly when you announce an early cancellation of a game that you never bothered to advertise right after its sister game ends, so there’s no need to worry about knock-on effects for the sales of the next console Tales game caused by a pissed-off fanbase. Given the posting date of this article, you might be tempted to believe this an April Fool’s Day joke. Let me be clear: It isn’t. I’m being a bit snarky about Bandai Namco’s relative lack of advertising for Tales of the Rays, but that’s about it for the joke. You can probably guess how things went down with the fanbase for Tales of the Rays. Given how poorly it was advertised, the people who found out about it tended to be the most dedicated Tales fans. And given that Tales of Link was announced to be ending a couple months prior, there had been significant effort among these fans to encourage ToL players to give TotR a try and to welcome them into the TotR fanbase. Hearing that TotR was cancelled as well, literally one day after ToL turned off its servers, did not, as it turned out, go over well with them. While players weren’t happy to see Tales of Link ending, the game had already run for a couple years and had been given a fair chance from the start. It was a good run for a free-to-play mobile game, and players were generally accepting that it had simply reached the end of its lifetime. Players mourned together, organized scrapbooks to thank the team involved for making the game, and finally threw a Discord party for the game the final day it was active. For Tales of the Rays, the reaction was quite the opposite. Instead of organizing a scrapbook to thank the team, TotR players organized a petition and feedback drive to complain about its cancellation. Appeals to be able to transfer to the Japanese version of the game were denied. Many players expressed that they’d never trust Bandai Namco again. Some of the saddest stories in gaming come when a game with great potential has it squandered, and it truly is sad to see Tales of the Rays end this way. If nothing else, hopefully this will serve as a good lesson for companies on how not to handle the ending of a game. And if you’re a Tales fan that is only now hearing about Tales of the Rays, all I can say is: I’m sorry you had to hear about it this way. There’s still time left to give it a try, but don’t wait too long: The game ends at the end of May.